This is the first game in the Ys series. For other games in the series see the Ys category. Ys: Ancient Ys Vanished, abbreviated to simply Ys (イース, Iisu?) 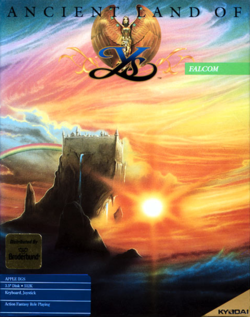 in two versions (see the names section for other various published names), is the first installment of Ys, an action RPG series developed by Nihon Falcom in 1987. Initially developed for the NEC PC-8801 by Masaya Hashimoto (director, programmer, designer) and Tomoyoshi Miyazaki (scenario writer), the game was soon ported to the Sharp X1, NEC PC-9801, FM-7, FM-77AV and MSX2 Japanese computer systems. Ancient Ys Vanished saw many subsequent releases, such as English-language versions for the Master System, MS-DOS, Apple IIGS, and TurboGrafx-16, and enhanced remakes for the Sega Saturn and Microsoft Windows systems. The game was also released as part of a compilation, Ys I & II, for the PC Engine/TurboGrafx-CD in 1989, along with Ys: Ancient Ys Vanished's 1988 sequel Ys II. Subsequent versions of Ys I & II were released, with new titles, for Windows (2000), PlayStation 2, Nintendo DS, PSP, again for Windows (Vista/7), and finally Steam. Long ago, the land of Ys was created by two goddesses, one which represented order and the other which represented freedom. Together, they watched over the land, as the people of Ys lived in harmony. A metal known as Cleria was discovered. At first, its discovery was seen as a sign of fortune, but it soon brought disaster to the land. Six priests wrote the collected history of Ys, its prosperity as well as its calamity, in six books, and these books were imbued with the power of Ys. Ys disappeared from the landscape soon afterward, but life around it continued on. When the game begins, a young adventurer named Adol arrives in the land of Esteria. He discovered a towns of people terrified by the monsters that roam the earth, as well as thieves who seem particularly focused on items made from silver. Adol meets a fortuneteller named Sara, who foresaw his coming. She calls upon Adol to brave many dangers and seek out the six legendary volumes which explain the mystery behind Ys' disappearance. Once he is fully prepared, Sara gives Adol a crystal for identification and instructs him to find her aunt in Zepik Village, who holds the key to retrieving one of the Books. With that, his quest begins. Versions of this game have been released from 1987 to as recently as 2009. In many cases, the game was released independently from it's sequel. However, because the sequel Ys II begins literally moments after the first Ys ends, they have been released together on numerous occassions as a compilation. Because of the multiple releases, as well as the various translations of the game that have been produced, the name of this game is often misspelled, rearranged, or simplified in various ways (officially and unofficially). Sources for these various names include the box artwork, the manuals, and the title screens. Surprisingly, many of the Japanese releases utilize English to display the title. Below is an attempt to summarize the various releases and the titles they used. For more information about each version, please see the version comparison page. NEC PC-88, Sharp X1, NEC PC-98, Fujitsu FM-7, MSX2 June-December 1987 イース Ancient Ys Vanished Omen The original computer releases, the main title of the game is written as an illustrated "Ys" on the box artwork, manual, and title screen, as opposed to the Katakana "イース" which is the formal release title. Famicom August 26, 1988 Ys, イース Both the English and the Katakana are displayed on the box artwork, while only the Katakana is displayed on the title screen. Ys: The Vanished Omen (US & Europe) The name was changed outside of Japan. The Brazilian box art contains the infamous and incorrect "Y's" with an apostrophe. Ys Book I & II (US & Europe) The first compilation release containing both chapters in one game. The title screen displays, "イース Ancient Ys Vanished". This version would go on to be released on the Wii Virtual Console in 2007. Sharp X68000 July 19, 1991 イース No usage of the illustrated English appears on the box art or title screen of this version. Sega Saturn November 6, 1997 イース Ancient Ys Vanished Omen Part of the first Falcom Classics compilation, the title screen utilizes Katakana instead of the illustrated English "Ys". Windows 95/98 April 24, 1998 Ys Eternal The first in a series of remakes which upgrade the look, feel, and sound of the game, as well as introduce new content. A VE (Very Easy) version was released in 2001. Windows 95/98 June 28, 2001 Ys Complete A slight enhancement to the original remake which introduced new difficulties and time attack mode. First released as a compilation, but later sold separately from Ys II Complete. PlayStation 2 August 7, 2003 Ys I & II Eternal Story A compilation based primarily on the Ys Eternal version, but with further changes to gameplay. Nintendo DS March 20, 2008 イースDS / Legacy of Ys: Books I & II The DS version of the game, originally released as separate titles in Japan, the two games were brought together on one cartridge for the US release. Windows XP/7, PlayStation Portable, Steam July 16, 2009 Ys I & II Chronicles Based primarily upon Ys Complete, the PSP version was released first, followed by the PC conversion in December, and finally the Steam re-release as Ys I & II Chronicles+ on February 14, 2013. This page was last edited on 20 February 2018, at 07:31.